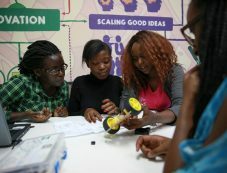 About 8 years ago, a group of African women in tech decided to launch AkiraChix – an ambitious effort to inspire and develop a successful force of women in technology. Based in Kenya, AkiraChix provides hands-on technical training and mentorship to young women and girls to increase the number of skilled women in tech and positively impact the community. Help change Africa’s future through a gift to the AkiraChix US Fund.